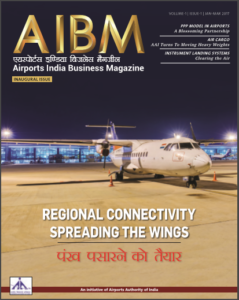 The new magazine will have an extremely rich, diverse and updated content, including in-depth reports, analyses as well as interviews with key players of the civil aviation business. With 84 pages of a very modern, European look and Indian content, the magazine will be published by Media India Group quarterly. Over 75,000 copies of this magazine would be distributed through various channels, reaching out to key players across the globe. Special counters and stands are being constructed at each airport in the country, where the magazine will be available for travellers. It will also be present in lounges and VVIP areas in the airports. Besides, it will be mailed to key government and corporate circles and especially, among those involved in the business of civil aviation.